Yesterday was World Vegetarian Day. 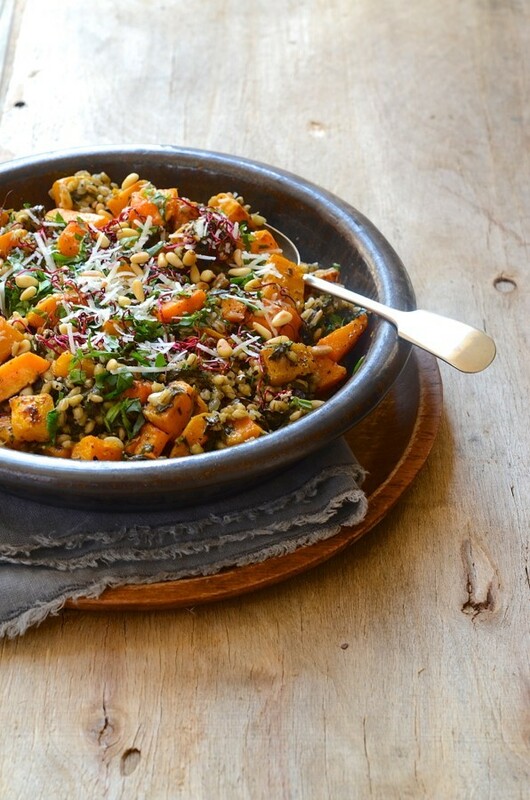 In case you missed it, here’s a nourishing veggie bowl for a simple and easy Midweek supper. 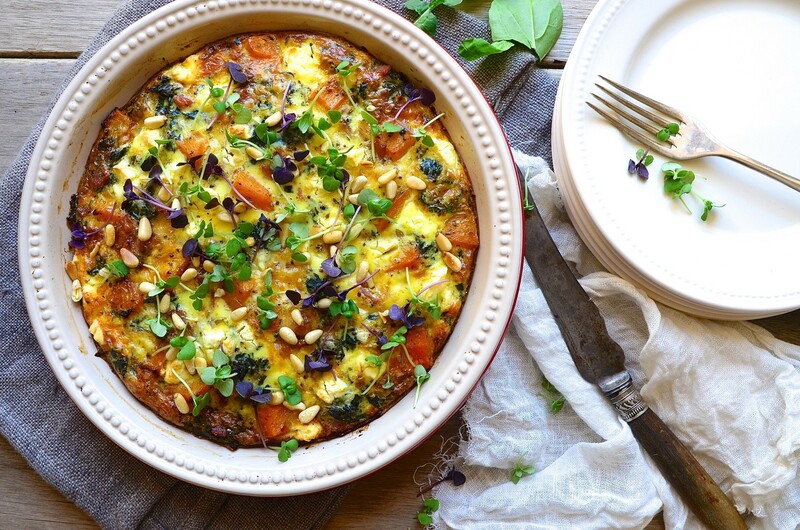 Perfect for evenings when you don’t have loads of time but still want a healthy and tasty dinner on the table. This is my favourite kind of food. 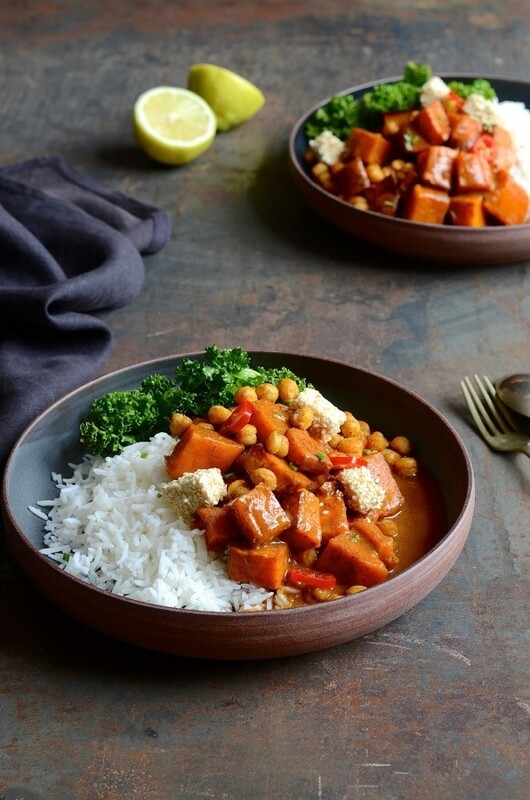 I love everything about this roast butternut tikka masala curry. 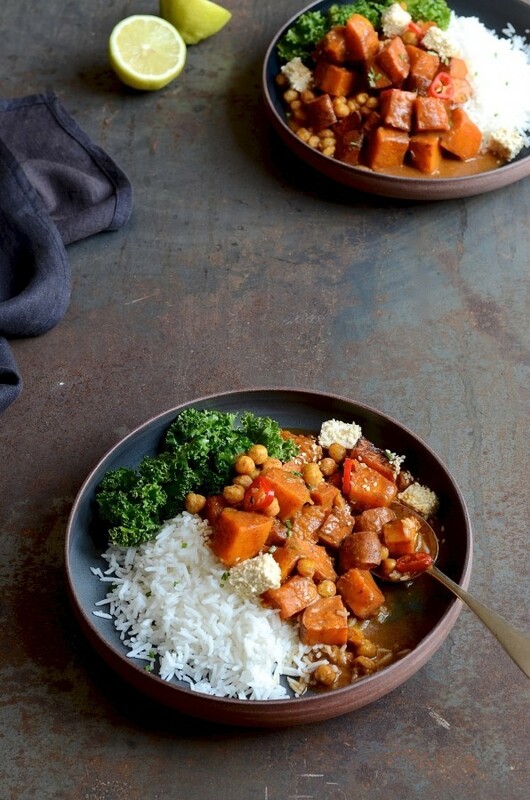 Heaps of colourful veg in a spicy coconut cream sauce, flash fried kale and crispy chickpeas. Amid the constant reminders to eat more fruit and vegetables, one message remains constant. Increase the amount of plant based food in our diets and aim to include a variety of different colours. In other words, eat the rainbow. 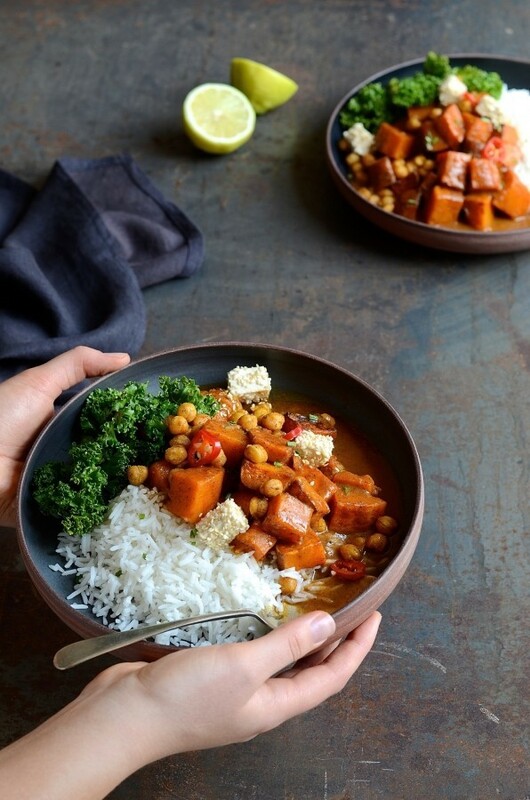 This bountiful bowl of goodness includes butternut, sweet potato, superfood hero, kale and pan-roasted chickpeas. 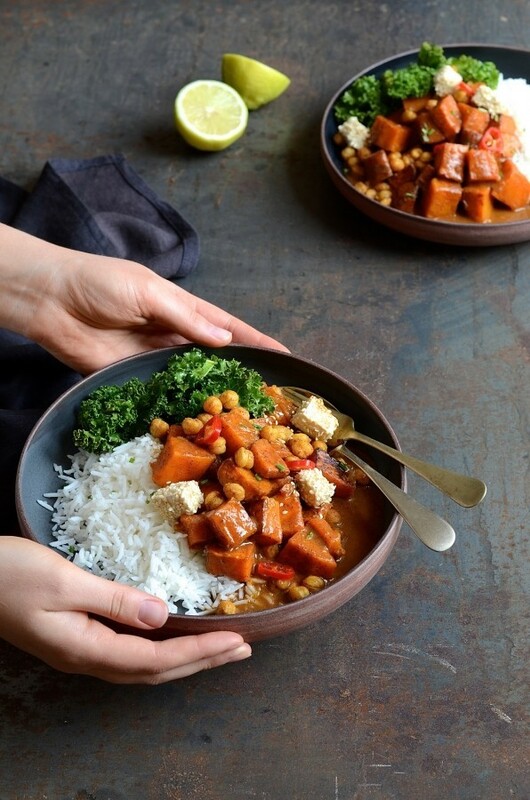 For a protein boost, silken tofu provides a creamy contrast to the spicy sauce. Tofu is low in saturated fats and a great source of calcium. I pressed the tofu in some toasted sesame seeds. Finding inspiration for everyday meals can be a challenge, even if you love to cook. When it comes to speedy suppers, a little help goes a long way. To this end, I always have a couple of ready made spice pastes stashed in the pantry cupboard. For this recipe, I used tikka masala paste. It’s spicy without being too hot. For extra flavour, I like to roast the vegetables before adding them to the creamy coconut sauce. The recipe itself is hardly work. It’s a matter of heating the paste with coconut milk and vegetable broth. Add the roast veg and serve with steamed basmati. And that’s dinner done and dusted. Enjoy! Spread the butternut and sweet potato onto a lined and greased baking sheet. Drizzle with 2 tablespoons olive oil and season with salt and freshly ground black pepper. Roast for 35-40 minutes. Heat the curry paste, coconut milk and stock together in a deep saucepan. Simmer for about 10 minutes until the sauce is slightly thickened and reduced. Add the roast vegetables and simmer on low for 5 minutes. Heat the remaining oil in a pan and flash fry the kale for 2-3 minutes. Remove from the pan. Add the chickpeas to the same pan and fry on high heat until golden and crisp. Season lightly with salt and ground coriander. 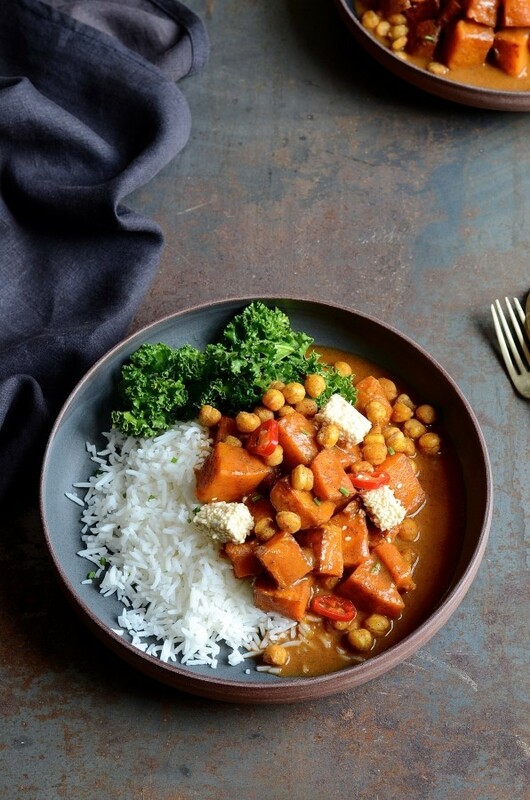 Serve the butternut curry with steamed basmati rice, kale and chickpeas. Finish with a squeeze of fresh lime juice and extra chili if you like it hot. 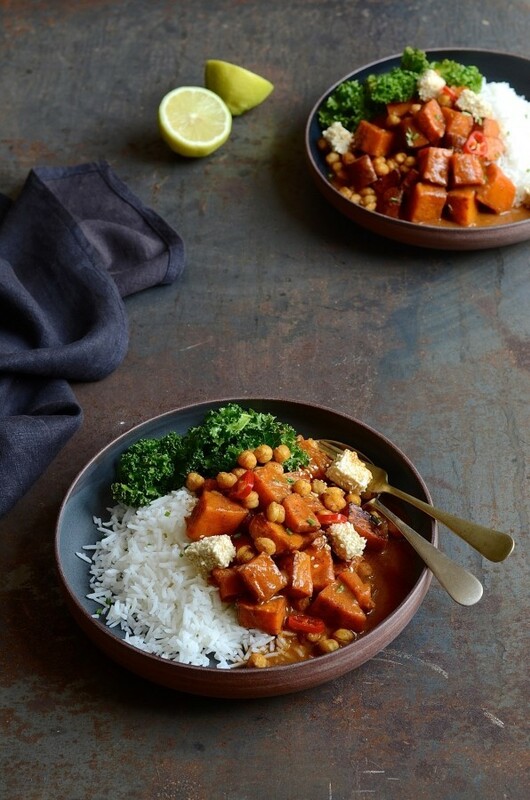 For more on Meatless Monday suppers, here are several other blog favourites.